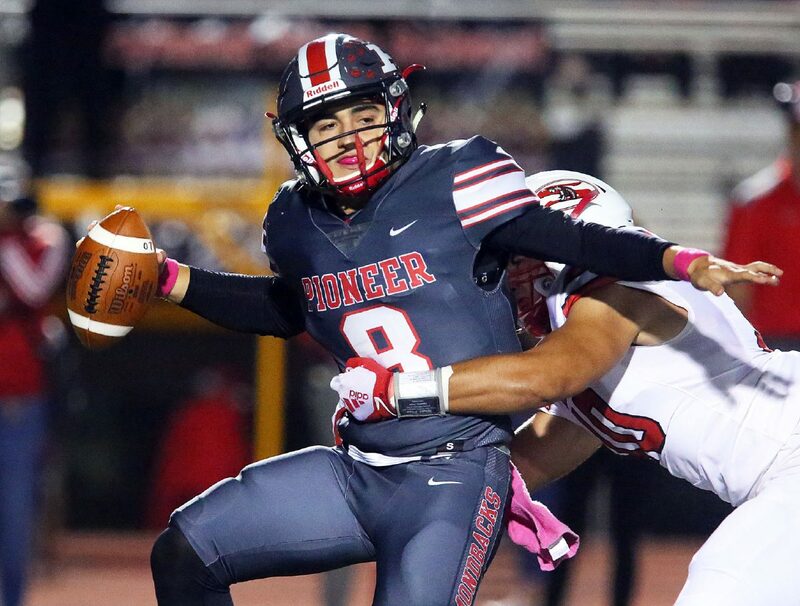 Sharyland Pioneer quarterback Jacob Rosales (8) is hit as he attempts to pass the ball behind the line of scrimmage by Sharyland High defensive player Javo Lopez (10) in a 16-5A Division II game at Richard Thompson Stadium on Friday, Oct. 19, 2018, in Mission. MISSION — After Sharyland High’s Week 7 win versus Edcouch-Elsa, coach Ron Adame met with senior quarterbacks Oscar Valdez and Edgar Longoria. Adame told his seniors that he would start Valdez this week against district rival Sharyland Pioneer. Adame’s decision didn’t change much for Valdez and Longoria. The two had been used interchangeably through various stretches of the season. Valdez earned the start, but he suffered an injury in the first quarter. Valdez, who also serves as the team’s punter and kicker, was sidelined for the remainder of the game. Longoria stepped in and kept the offense moving throughout the night. Wide receiver Gabriel Tamez made all five extra points and his only field goal attempt in the fourth quarter, but it was a big one. Tamez nailed a 21-yard kick as time expired to give the Rattlers a dramatic 38-37 victory over the Diamondbacks. 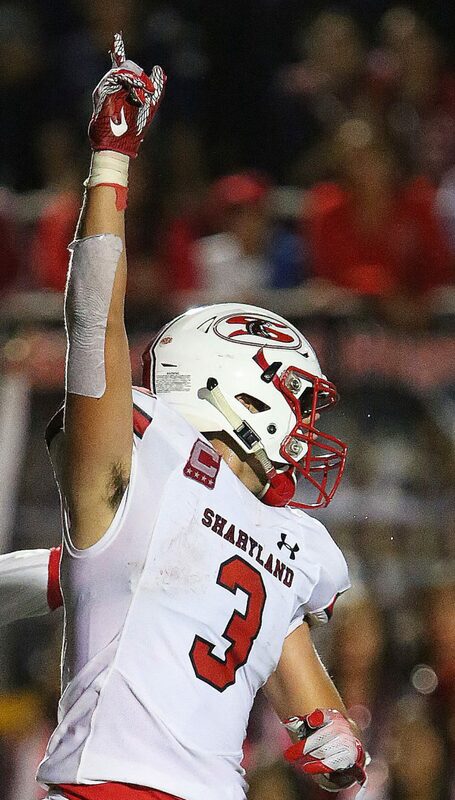 Sharyland High's Gabriel Tamez (3) celebrates after kicking the game winning field goal against Sharyland Pioneer in a 16-5A Division II game at Richard Thompson Stadium on Friday, Oct. 19, 2018, in Mission. Sharyland High quarterback Edgar Longoria (4) passes the ball against Sharyland Pioneer in a 16-5A Division II game at Richard Thompson Stadium on Friday, Oct. 19, 2018, in Mission. 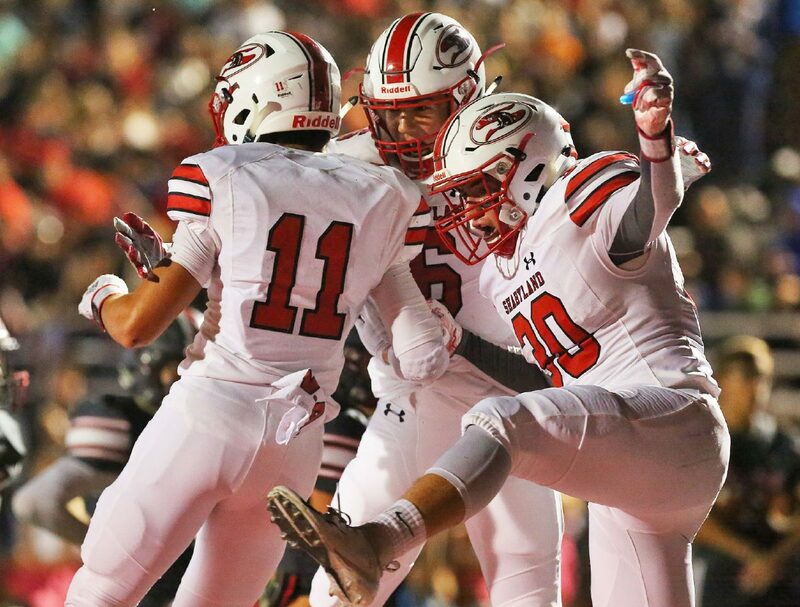 Sharyland High wide receiver Ruben Davila (6), center, celebrates his touchdown with teammates Adrian Solis (11) and Danny Escalera (30) against Sharyland Pioneer in a 16-5A Division II game at Richard Thompson Stadium on Friday, Oct. 19, 2018, in Mission. 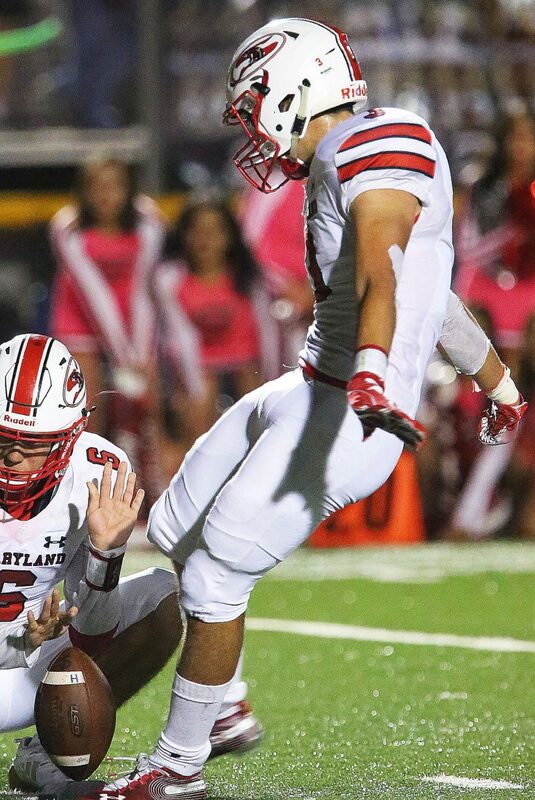 Sharyland High's Gabriel Tamez (3) kicks the game winning field goal against Sharyland Pioneer in a 16-5A Division II game at Richard Thompson Stadium on Friday, Oct. 19, 2018, in Mission. Sharyland Pioneer wide receiver Diego Perez (10) carries the ball as he is stopped by Sharyland High defensive player Santino Pascual (22) in a 16-5A Division II game at Richard Thompson Stadium on Friday, Oct. 19, 2018, in Mission. 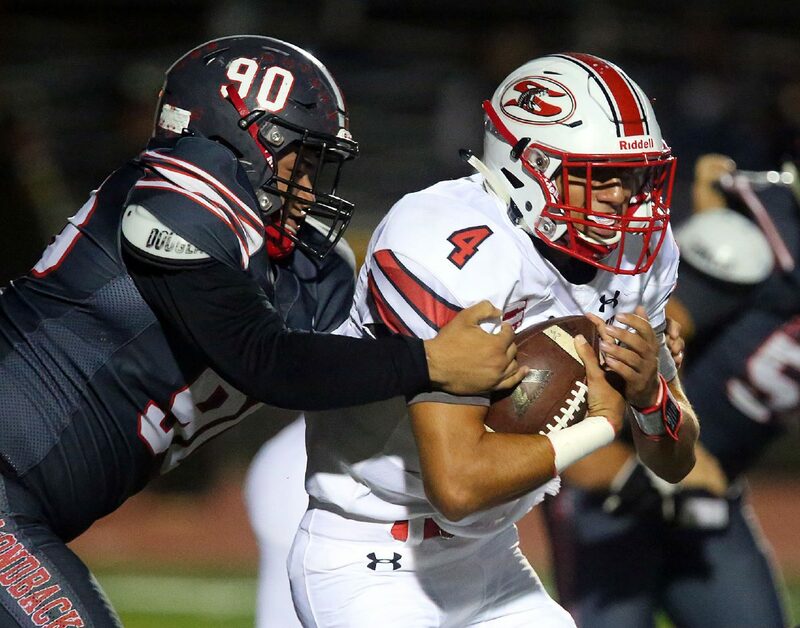 Sharyland High quarterback Edgar Longoria (4) carries the ball against Sharyland Pioneer defensive end Alonzo Ibarra (90) in a 16-5A Division II game at Richard Thompson Stadium on Friday, Oct. 19, 2018, in Mission. 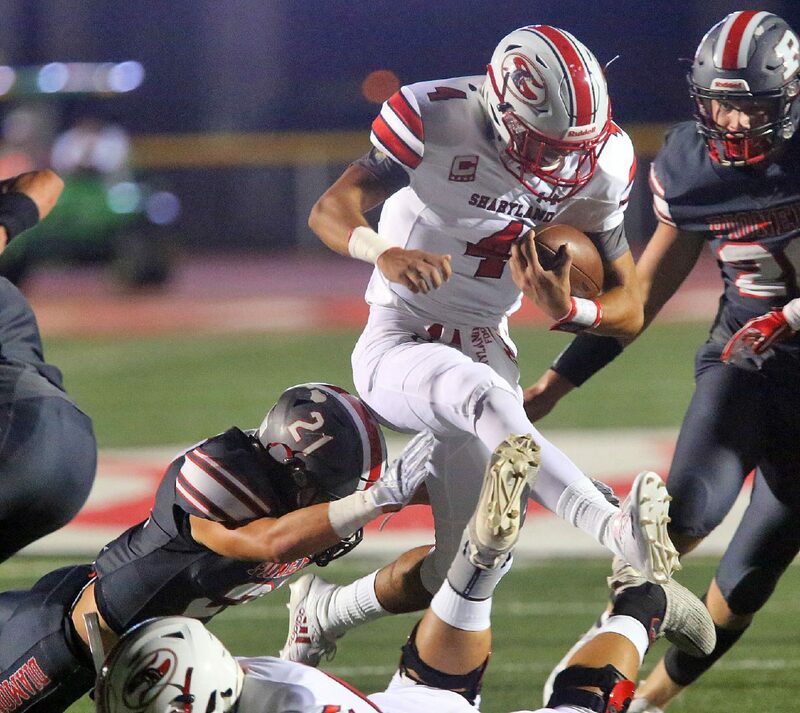 Sharyland High quarterback Edgar Longoria (4) leaps through the Sharyland Pioneer defensive line as he carries the ball in a 16-5A Division II game at Richard Thompson Stadium on Friday, Oct. 19, 2018, in Mission. 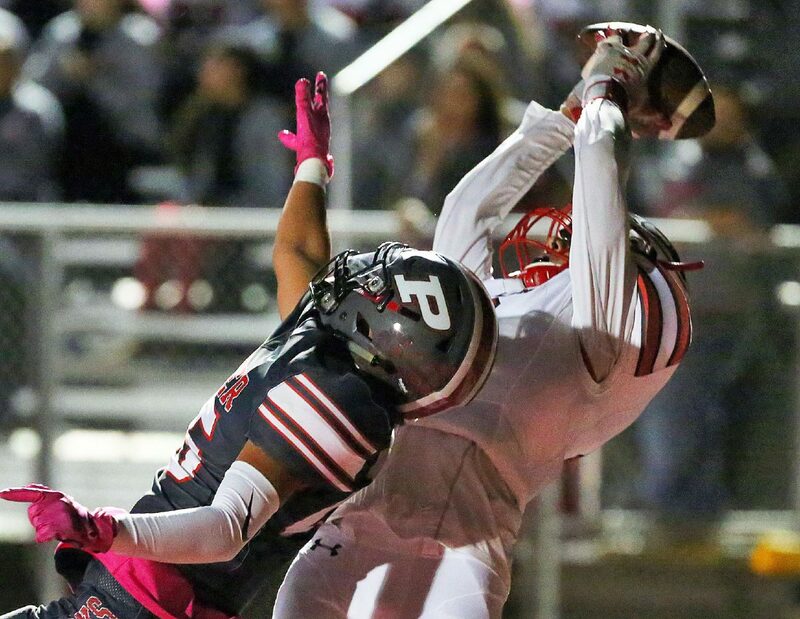 Sharyland High wide receiver Ruben Davila (6) catches the ball in the endzone against Sharyland Pioneer defensive back Marco Oviedo (25) for the touchdown in a 16-5A Division II game at Richard Thompson Stadium on Friday, Oct. 19, 2018, in Mission. The Rattlers and Diamondbacks were tied at the end of the first and second quarters, but Sharyland High owned a four-point lead entering the fourth. 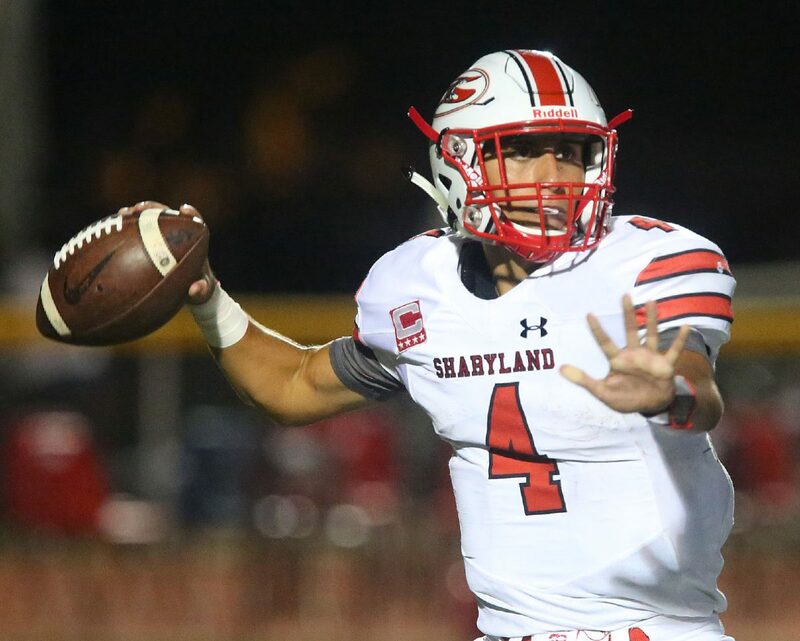 Last year’s Snakeskin Classic was also a nail-biter in favor of Sharyland High. Longoria ran wild against the Diamondback defense on Friday like he did a season ago. As a junior in 2017, Longoria ran for six touchdowns vs. Pioneer. His last score came with nine seconds left in Sharyland High’s 56-49 win. In his last Snakeskin Classic, Longoria ran for 155 yards and punched in four touchdown runs. The Rattlers (5-3, 4-0) ran for 337 yards as a team. Adame said Valdez suffered a leg contusion that didn’t allow him to plant his foot with confidence, but the extent of the injury isn’t yet known. Sharyland Pioneer (4-3, 2-1) took a lead early in the fourth quarter on a one-yard touchdown pass from Jacob Rosales to Diego Benavides. Facing a 35-31 deficit at the Pioneer 21-yard line with 1:30 left, Rosales rolled around the pocket looking for a receiver before flicking a pass deep to a wide open Roel Cajero. Cajero took it to the house, a 79-yard pass play. Pioneer committed a 15-yard penalty that was enforced after ensuing kickoff. The Rattlers started their drive from their own 40-yard line instead of the 25-yard line. Sharyland High relied on its seniors — Longoria, running back Adrian Solis and wide receiver Ruben Davila — to get them to the four-yard line with two seconds left where Tamez, another senior, delivered the knockout punch. Sharyland High now has an inside track to a district title with two games to go. 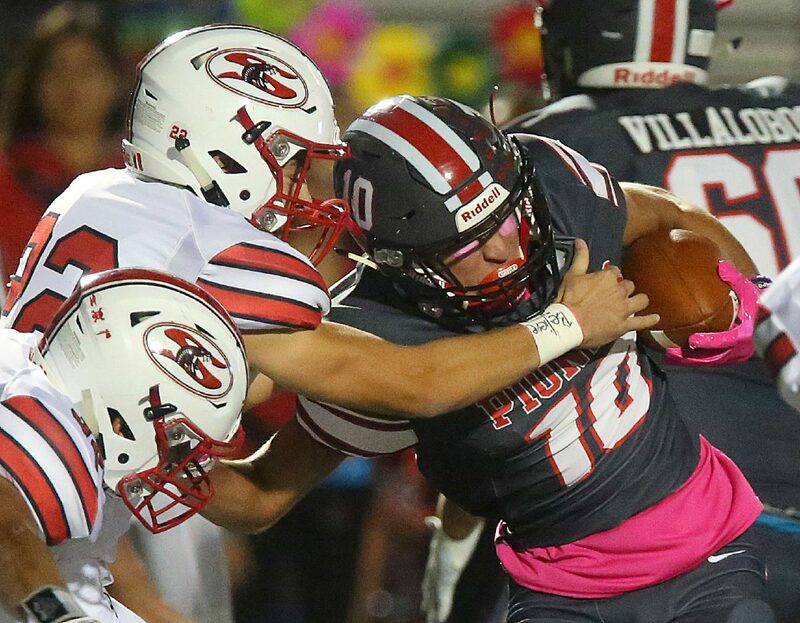 Sharyland Pioneer defeated Valley View in Week 7, who started the season 6-0, but the Tigers have now dropped their last two games in district play.